The L.A. Conservancy and its Modern Committee brings Pacific Standard Time: Art in LA 1945-1980 to Claremont and Pomona this weekend for "Millard Sheets: A Legacy of Art and Architecture," a look at Pomona native Sheets' influential work there. "His mid-century designs completely integrate art with architecture; he is perhaps best known for the iconic, mosaic-covered branches of Home Savings," the Conservancy writes. "In recent years, Sheets's work has grown increasingly vulnerable to demolition and excessive alteration." · Former Millard Sheets Studio (1956-9) -- Sheets designed this complex in Claremont for use as his own design and mosaic studio, covering the exterior with small mosaics. Now used as a medical office, the site remains remarkably intact, inside and out -- down to Sheets's former office, replete with original furniture and cork paneling. · Garrison Theater, Scripps College (1963) -- Sheets led the art department at Scripps for nineteen years and created this wonderful theater in a blend of modern and neo-classical design. The grand entrance features monumental mosaics depicting scenes from Shakespeare, and the two-story lobby has original tapestries by artists Jean and Arthur Ames. 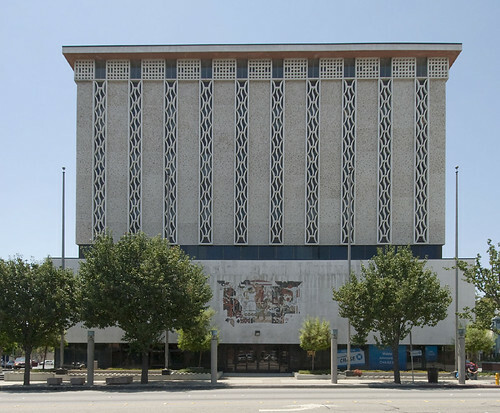 · Pomona First Federal, now American Museum of Ceramic Art (1956) -- This bank complex now houses the American Museum of Ceramic Art (AMOCA). Now gallery space, the former banking lobby features a nearly 80-foot-long painted mural by Sheets depicting the history of the Pomona Valley. In the same room is AMOCA's Pacific Standard Time ceramics exhibition Common Ground, featuring hundreds of works by artists who had a direct connection to Sheets. · Pomona First Federal, now US Bank (1969) -- Nearly unchanged since it opened, this former branch of Pomona First Federal combines the modernism, neo-classicism, mosaics, and mural art associated with the best of Sheets's famous Home Savings designs. · Pomona Mall (1962) -- Pomona's downtown mall was the first pedestrian mall in America west of the Mississippi. 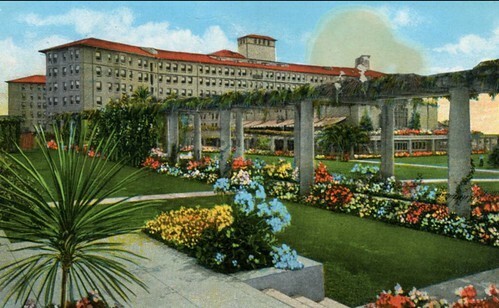 To create the mall, Millard Sheets closed off nine blocks to car traffic and unified the area using planters, mosaic- and sculpture-covered fountains, and simplified building facades. Five blocks of the mall have since been reopened to car traffic, yet many historic features remain intact. · (from the Mall) Home Savings Tower, now Chase Bank (1963) -- From the Pomona Mall, we'll discuss this elegant tower designed by Sheets to anchor the mall. The six-story building was designed for Home Savings, and the exterior grillwork weaves the initials “H” and “S” together. Its upper floors are currently covered for repairs, yet one of Sheets’s trademark mosaics is visible on the façade. A panel discussion follows. The event takes place Sunday, March 18, 2012 - rain or shine - from 11:30 a.m. to 4 p.m.; the panel discussion is at 5 p.m. Tix are $30 for the general public; $25 for L.A. Conservancy members; $15 for students; and $10 for kids 12 and under. Go to http://lac.laconservancy.org/sheets for more info.